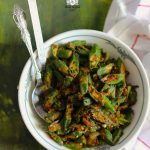 Masala Bhindi Recipe is a simple yet delicious crispy okra recipe, ideal to make for everyday meal. To prepare Masala Bhindi, first wash and pat dry the ladyfinger. Cut each ladyfinger vertically into broad size pieces. Mix ginger garlic paste, salt and gram flour with the chopped ladyfinger. Stir to coat each piece nicely with the spice rub. Keep aside till required. Heat oil in a kadhai ( buy it here ) over medium heat. Add fennel seeds, nigella seeds, fenugreek seeds, cumin seeds, asafetida and fry for 2 - 3 minutes or till aroma of spices is released. Next add the chopped onion and chili. Fry till onion turn light brown in color. Add ladyfinger in the kadhai ( buy it here ), stir - fry for next few minutes. Once ladyfinger start cooking, add remaining spices and salt. Stir to combine. Cover and cook till ladyfinger is cooked through. Serve Masala Bhindi with dal and phulkas for lunch.